I was there when Greg Norman came to Doonbeg to launch the building of this new course. For each day I arrive at Doonbeg through the arch and into the Courtyard I feel at home. 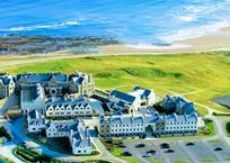 The place is indeed a FIVE STAR class act, from the minute your car or coach arrives into Doonbeg to getting breakfast and onto the links the welcome, style and passion for golf climbs to a new levels. Several changes were made updating this links course to what it is today and Doonbeg doesn’t stop there. They have a caddie program that’s second to none. The finest Far Five links opening Hole in Ireland with the green set in the base of the sand dunes. I forget to tell you about lunch at Darby’s Bar overlooking the 1st hole as seen below after the golf with a welcome pint of Guinness! The above image is the opening hole at Doonbeg Golf Links. Doonbeg Golf Club Green fees are 170 Euros a person for 2013 season High Season. Or conbine both course with Ballybunion and Doonbeg Golf Vacation Packages.